"See, here's the anxiety: there's two schools of thought in Second Life. One is, leave all problems of real life outside; this is a game. The other is, let's look at the interesting way real life issues play out in a virtual environment. "So it's really an interesting question, and I don't know even after discussing it with you, where I stand on this... I mean, it's like being something you can hide, and never having to admit to. But it's still there for you -- so now I know how it feels to be something you can hide, but still having the compulsion or desire to be open about it. 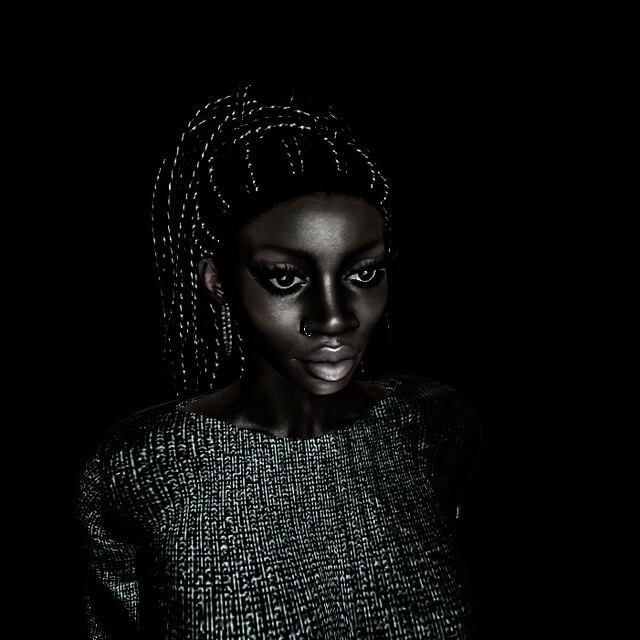 "The folks that want to leave real life issues out, may feel that simply by disclosing my race, I've brought the ugly issue of race in Second Life. And what I can't answer for sure, one way or other, is if they are correct. Is race here, if no one admits to any race? Do I create race issues by claiming race?" She spent three months in the skin of a black woman. Some of her friends shied away, she believes. Then there were the "guys that thought I was an easy lay, for lack of a better term. It scared me honestly, some of the assumptions made. Especially here where everything [in avatar appearance] is changeable with a click. I lost a couple of what I thought were good friends [who] stopped IMing and chatting. They were polite to a fault when I showed up, but [it] was weird. You know how you interact and something changes and no one tells you. Some were subtle, some weren't." She laughs without mirth, recalling how some friends would ask her questions such as, "'[L]ike, when you going back to being you?'" In honor of the Reverend Martin Luther King Jr., a special sun is made to arc across the grid of Second Life today. If you look close enough, you'll see it's inset with the face of the man who was so untimely cut down, when far too much of his work remained. In his country, the world beyond, and, perhaps, in worlds he never could have imagined. And in this way, Dr. King literally shines down on an empty field, where once the forces of division made a bid to establish themselves. But I wonder what he'd make of the subsequent reaction, from high-minded words and protest, to decidedly violent uncivil disobedience. As for Front National, though they're gone from the land of Porcupine, they claim to be unphased. "They're a bunch of losers," FN Officer Wolfram Hayek tells me grinning, when I ask about the protesters. "We're gonna tighten security and come back." I imagine if there's a rule about being an ethnic avatar, it's similar to one rule of drawing humans: avoid sterotypes. Perhaps it's because I see sterotyping not so much as hateful but foolish, but avatar appearance isn't really that big a deal to me. "If you aren't black, the luxury of throwing on a black skin and playing black should make you think about why you want to do that." So says the white guy Second Life blogger. Indeed, the blog post makes me wonder what questions somebody might have me ask myself when I purpose to wear my Gollum avatar. The division of races in SL is the most ridiculous thing I've seen in 7 years and it's something I know exists, I've lived it. I am European, my paternal origins are from europe and my mother is latin, my father blond... blue eyes, my mother brunette with green eyes and not frizzy hair. My real traits is tanned skin without curly hair and green eyes, in SL opt for an avatar of color because I love black people as much as white, my girlfriend is black from Kenia is beautiful. What did I discover? In many adult sims the male black avatars are well appreciated, the same does not happen in other types of sims, in a very famous auto shop I went to buy 3 cars in a single purchase about 9,000 L $, but I had some doubts, I watched the help person went fast to talk to some people who arrived long after me, a few minutes later they left, I asked him if he could help me and he finally approached me, after talking For a few minutes about the cars I bought those 3 and this person was surprised, I asked him to tell me about the car ourchased by those people (I really wanted to know if they bought one) and he answered "they didn't buy any", I replied to him that sometimes a good customer is the least expected. I don't know how is to be a person of color in the US (the country where more SL residents are) but if they move their stereotypes (both ... black and white people) SL is free to fly, teleport, build, unite thousands of people of different origins, cultures, religions and we are going to tie up ourselves to a skin color? that is extremely ridiculous and immature. At least from my POV. Racists make it about race. Fascists tell you what you have to think and do about race. All have lost touch with reality. Prejudice, hate, and intolerance are well and thriving in SL. The most surprising part is the Nineteen Eighty-Four Orwell dystopia is coming to life. Everything is upside-down and/or reversed. Those demanding tolerance are the least tolerant. The loudest voices against fascism are the most fascist in action. The home of free speech, Berkley, is the most opposed to free speech. And it is all a part of SL. Thank you for sharing this wonderful. I always love to ready informative blogs. Keep posting the future updates. Some of the stereotyping is pretty shameless (someone going for a 'urban gangsta' look, for example). I've had a number of darker-skinned avatars, but avatar design is a large part of what I *do* in Second Life; if I feel like my mecha-centaur girl should seem like some kind of mixed-race for the concept in my head, she's gonna be brown. I actually have worn black skins (I mean most days I'm a pearl white robot or a purple demon girl I run the gamut on skin colors.) And people have asked me why my avatar is "darker" or made negative comments. I don't go oh haha im white. I say "I thought it looked cool/beautiful." I don't need to make excuses for dressing my avatar in a way I feel looks good. Why should I? It's hard to tell what Martin Luther King Jr. would think about all of this. I believe his message was about freedom and that's probably why he was shut up. This tribute, focusing on skin color, falls within the acceptable boundaries of what he and us are permitted to talk about. We all know that we need to nod our heads and applaud in approval and walk a very narrow path through these landmines. When King started broadening his vision and saying that the real problem might be "class", that's when he had to go. You know, there was a brief hopeful period in the seventies when all of this "color" problem began a healing process. Organically, things were starting to repair. Unfortunately, it didn't survive the class restructuring of the 80's and 90's that was hammered down by both political parties. I fear that King's message has also been conveniently restructured into something divisive and celebrated by a holiday for elite institutions a little more bustle for the retail working class. Really? I have one question, do these people know, that some people are biracial. So they are trying there best. Another big thing, it's a virtual world, you can be whoever you want to be, without being criticized, or being told you are wrong for being a different race, then what you really are. I really don't understand this, SL allows us to have creative freedom with our avatars. What is the problem, with a white woman using black girls skin? That and if you actually look hard enough, there is a tonne of different shades of black, at different stores. You just gotta do a bit of detective work.